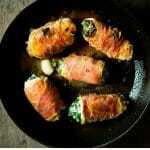 Chicken involtini stuffed with zucchini, spinach and ricotta and wrapped in prosciutto. An elegant and exceptionally delicious main dish perfect for date night or weekends! First, you need to slice the zucchini/courgette as thin as you can (don't worry if the strips aren't perfect). Rub them in a little olive oil then place them on a hot griddle pan until soft and slightly charred on each side, set them aside to cool. Finely chop the onion and add to a pan with a little olive oil, sauté until soft and translucent. Once soft add the spinach and 1 chopped garlic clove and cook down until the spinach has wilted. Set aside to cool. Once the spinach has cooled roughly chop it then add it to a bowl with the ricotta, parmesan, nutmeg and a pinch of salt and pepper. Mix it all together. To make the chicken involtini lay the thinly sliced chicken breasts on a clean work surface. You may need to bash the chicken to a thickness of 1/4 inch. You can do this by placing the chicken in between baking parchment or cling film and beating it lightly with a rolling pin. Add a layer of zucchini to cover the chicken as best you can (the whole surface doesn't need to be completely covered). Add a heaped tbsp of spinach and ricotta just slightly above the middle and roll the chicken and zucchini over the filling. Once you have your chicken involtini, lay them at the top of a large slice of prosciutto and roll it around the chicken. Add a little olive oil to a large pan and brown the chicken/prosciutto on all sides. Once browned add the wine and whole garlic clove and cook the chicken involtini for 15 minutes. If the wine reduces too much add some water a few tablespoons at a time. Serve with creamy mashed potatoes and a vegetable side such as roasted fennel, green beans or salad. If you can't find thinly sliced chicken breasts or medallions you can use the same method above for bashing regular chicken breasts. 2 chicken breasts will be enough for 4 people. Cut each chicken breast in half before bashing them thin with a rolling pin, cut each half in 2 to create 8 thin slices.